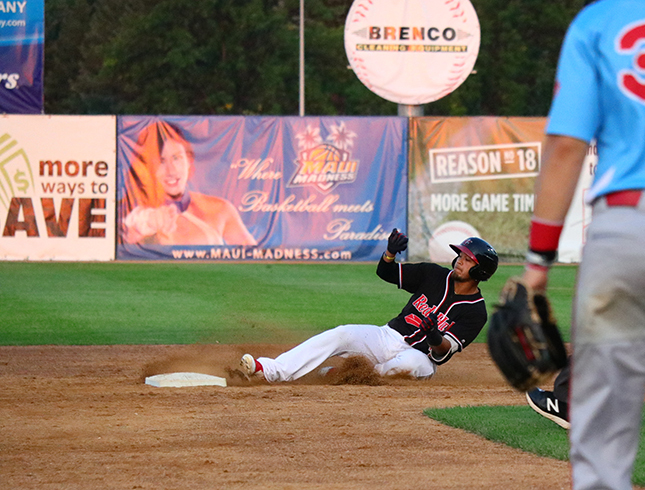 08/07/2018 11:03 PM - FARGO, N.D.  In the longest game at Newman Outdoor Field in 2018, the Fargo-Moorhead RedHawks were defeated 12-7 Tuesday night by the Chicago Dogs in front of a sellout crowd of 4801 fans. Chicago scored five runs in the second inning  four of which came on a grand slam by Trey Vavra  and never looked back to tie the series at a game apiece. The RedHawks got within one run at 7-6 when they scored two runs in the seventh, but Chicago added five runs in the ninth to earn the victory. Trey McNutt gave up seven runs on eight hits over 5.0 innings for his seventh loss of the season. The right-hander is now 5-7 with a 5.75 ERA in 15 starts for the RedHawks this season. Center fielder Devan Ahart led the Hawks on the offensive side, going four-for-five with three runs scored in the loss. Ahart ranks fourth on the team in batting with a .315 average in 74 games this season. The RedHawks will try to win the series against the Dogs in the rubber game tomorrow night at 7:02 PM.